BACKGROUND: Cardenas' vision of the future of digital entertainment is based in part on a background as an electrical/controls contractor and home builder. THE CHALLENGE: Now that NetStreams has established its technology leadership in IP-based distributed audio and control in the residential market, it has entered the commercial market to do the same. 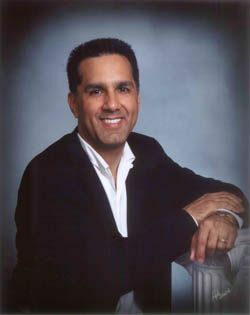 Herman Cardenas: I founded NetStreams almost four years ago and I serve as CEO for the company. Since its inception, I've been responsible for setting the company's strategic vision and direction, and spearheading the growth of the company. I have over 27 years experience in electronics and have established several successful businesses throughout my career. My background as an electrical/controls contractor and home builder, and my participation in directing and developing technology and systems for lighting control, automation, structured wiring, and audio/video distribution all became building blocks that molded my vision of the future of digital entertainment. This vision, coupled with the influence of an individual who I trust very much (my CTO), drove my decision to start NetStreams to develop IP-based distributed entertainment and control systems for residential and commercial applications. When we started the business in 2002, our short term goal was for NetStreams to become the best at distributing audio/video in multi-room applications. By October of 2004 we had accomplished that with our DigiLinX IP-based distributed audio and control system, and we are continuing to build that business. Now that we've established our technology leadership in IP-based distributed audio and control in the residential market, we have entered the commercial market to do the same. Our longer-term goal was to deliver uncompressed (1080i or higher), IP-based video distribution. At the 2006 InfoComm show in Orlando this June, NetStreams demonstrated its new IP-video technology/products. What NetStreams has done for high performance audio over TCP/IP networks, we are also doing for high-definition video. We believe that in the future, almost all electronic products and devices in a residential or commercial audio/video system will have their own IP address. This includes speakers, source products such as music and video players, HD and satellite radio, lighting thermostats, appliances, and more. Industry pundits have pondered the implications of convergence and the effects of the computer industry on consumer electronics' technologies. With the introduction of NetStreams' DigiLinX system, the custom install industry has begun to realize the most profound impact of computer technologies in their marketplace. Are there new initiatives we are likely to see from NetStreams? A new initiative at NetStreams is the development of IP-based multi-channel audio products for home theater applications. Other technology initiatives include expanding our StreamNet technology to include other physical mediums outside of Cat-5, such as wireless, power lines, and phone lines. Perhaps the biggest new initiative that we will undertake is building an OEM/licensing group. Many manufacturers have approached NetStreams with interest to license StreamNet technology in order to deliver their own IP-based audio/video and control solutions. Polk Audio was the first to incorporate our technology into their speakers, delivering the world's first IP-based speakers. NetStreams, with its patent-pending StreamNet technology, is well positioned to be the leader in providing other manufactures the ability to jump into this emerging market, without the years of research/development and investment that it would require otherwise. How reliable are the technologies that allow NetStreams to send content via IP, and will the company's work with HD video content affect the quality of transmission? NetStreams developed its StreamNet technology to ride over TCP/IP. TCP/IP is a four-year old international standard developed for the transport of packets of computer data. Our StreamNet technology adds the reliability not found in TCP/IP today, by insuring real-time synchronization and control of AV streams, point-to-multi-point. The StreamNet architecture ensures that the high band-width demands of uncompressed audio and video streams do not interfere with the demands and performance of computing products in residential or commercial networks. StreamNet technology guarantees that audio being played across several speakers or several rooms will all play fully synchronized, within a maximum delay of 1.5ms. Latency from the time the audio leaves the source to the time it arrives at a speaker is a maximum of 20ms. On the video side, the latency will be less than 50ms.